Note: This column has been corrected to reflect that Myosotis alpestris, the alpine forget-me-not, is the state flower, not Myosotis scorpiodes. I am not a fan of forget-me-nots. In particular, I do not like the so-called annual variety, Myosotis sylvatica (actually a biennial), which is in bloom right now in Southcentral Alaska. I even don't like the various cultivars that have been developed to improve these flowers. I always urge gardeners to stay far away from all of them. Just ask my wife. She does like Myosotis sylvatica for the mounds of blue flowers they produce. Normally, I would do anything to satisfy her likes. I draw the line, however, when it comes to any form of Myosotis; they are the one plant not allowed on our property. I don't even like to see them used in a gifted flower bouquets lest the flowers escape and plants invade the yard. One of my (many) annoying habits is to insist folks to get rid of forget-me-nots whenever I come upon these plants. The rant I summarize here today can really come across as lunacy in person, I am sure. Let me pause to note that I don't much like the perennial forget-me-not variety, Myosotis scorpiodes, either. These plants tend to grow in wet, what used to be called swampy, areas, and they spread by underground runners. They have a longer period of bloom than the other variety and are not nearly as invasive. 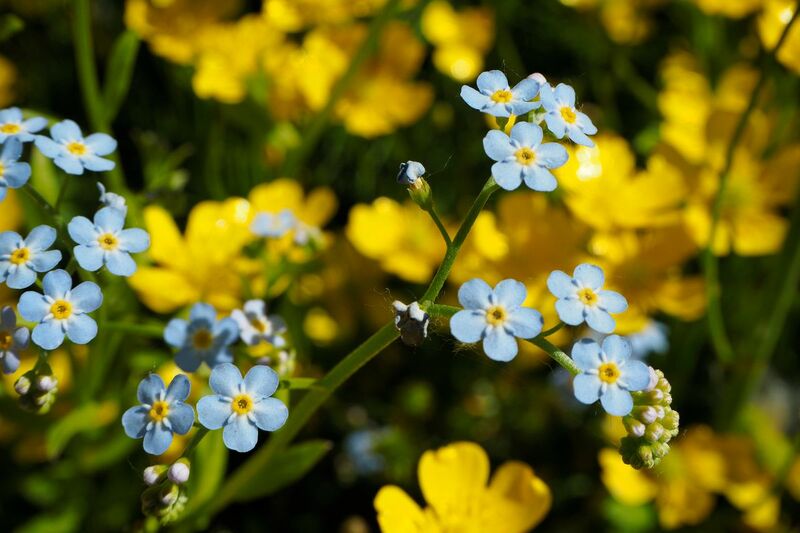 Perennial forget-me-nots are much harder to find, and most Alaskans have never seen them, thinking the much more commonly available Myosotis sylvatica is the state flower ( The state flower is Myosotis alpestris, the alpine forget-me-not, and it isn't a big spreader). Still, the real problem plants are the Myosotis sylvaticas. These go to seed, and in the late summer the plants germinate and start the spread. And I mean spread. Just look up some articles on them. Everyone lavishes much praise on the cute, diminutive blue flowers, but if you read with the eye of a seasoned gardener, you instantly know biennial forget-me-nots present a real danger. Just by way of a quick example, an article I found on the internet notes, "Once you have forget-me-nots in your garden, you're likely to always have them." No kidding! Another points out that "The self sowers may become invasive unless spread is controlled by dead heading." Warning Will Robinson. Warning. Warning. Warning Will Robinson! Hopefully, this article will find its way into the Google listings and future inquirers about the plant will read my lone warning: Do not plant Myosotis sylvatica. Ever. Never. Period. Not in the ground. Not in a basket. Not in a planter. Not with green eggs or ham. Ah, but what about the thousands, if not tens of thousands of Alaskans who have already planted Myosotis sylvatica in their yards? I know many have because one year a prominent state bank celebrated its anniversary by mistakenly giving away free packets of Myosotis sylvatica, an act for which there should be a federal regulation to prevent in the future. And, a number of prominent politicians have handed out Myosotis sylvatica while running for office. Seriously, how can you vote for someone who mistakes the state flower for a noxious weed? Anyhow, all of these free packets were planted by Alaskans who thought they were doing the patriotic thing, even though Myosotis sylvatica is not the state flower. Every single one of these seeds germinated, too, because this is one extremely easy plant to grow, which explains its ability to take over a garden in a couple of seasons. The Alaska Botanical Garden is still dealing with the problem some 15 or so years after it was mistakenly planted in one bed and spread before being discovered. My advice? Do you really need to ask? While the first rule is to never, never, never let any flowers of Myosotis sylvatica go to seed, the second is to pull Myosotis sylvatica as soon as you first notice their hairy leaves in the spring (and again in the fall after the seeds germinate). Cut plants left when you see the beginning of the myriad blue flower buds in late May. Dig 'em out when they are in bloom in July. I wouldn't even compost them. Instead, put them into a bag and toss them into the garbage. Above all, once freed of the danger, do not accept Myosotis sylvatica as gifts, even in bouquets. And, just to be safe, alert the neighbors. Forget forget-me-nots! National mud day: 12-3 p.m. June 29. Join the Alaska Botanical Garden and the Anchorage Museum for some muddy fun. Members and kids under 10 are free. All others are $5. Annuals: Deadhead flowers to keep the plants producing more instead of seeds. Lettuces, radishes: Harvest if ready.